Kheer is the Indian rice pudding, the most common dessert we used to enjoy in our times. Now a days the most common dessert seems to be a slice of cake or a brownie but kheer ruled my childhood. Chawal ki kheer or this rice pudding was almost an everyday affair in many families I know but in our home we did not eat much meetha (desserts) everyday so kheer was made about twice a week or so. The special occasion kheer used to be a little rich with more nuts, slow reduced milk till it turns pinkish and saffron etc used to be added to the special occasion kheer. 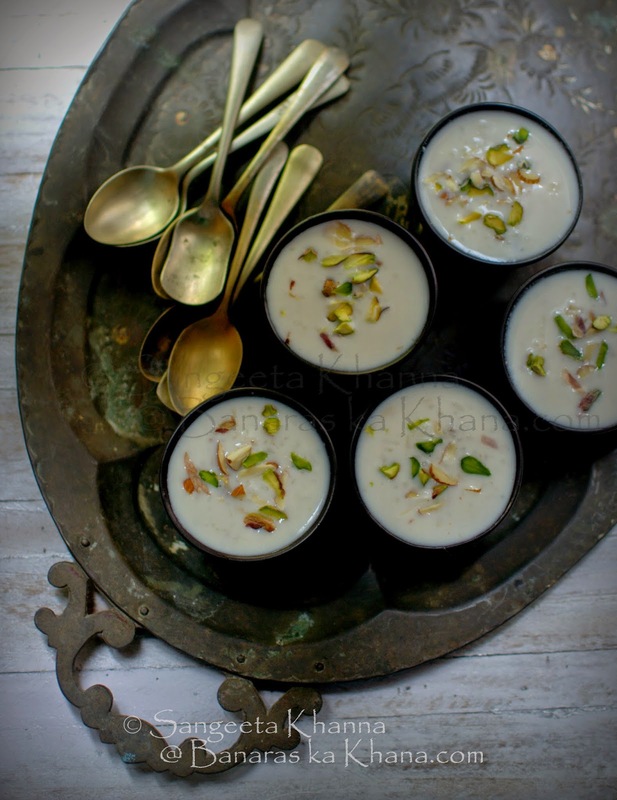 The everyday kheer would be cooked and reduced for lesser time for convenience and a few nuts would be added because everyone loved the occasional bite of cashew and almonds. Oh and we loved the plump raisins so much in our kheer. The everyday kheer would sometimes include some chopped dates or grated coconut or some grated carrots for colour but it was certainly lighter than the occasional festive kheer. The question is, which one was the best kheer out of these? 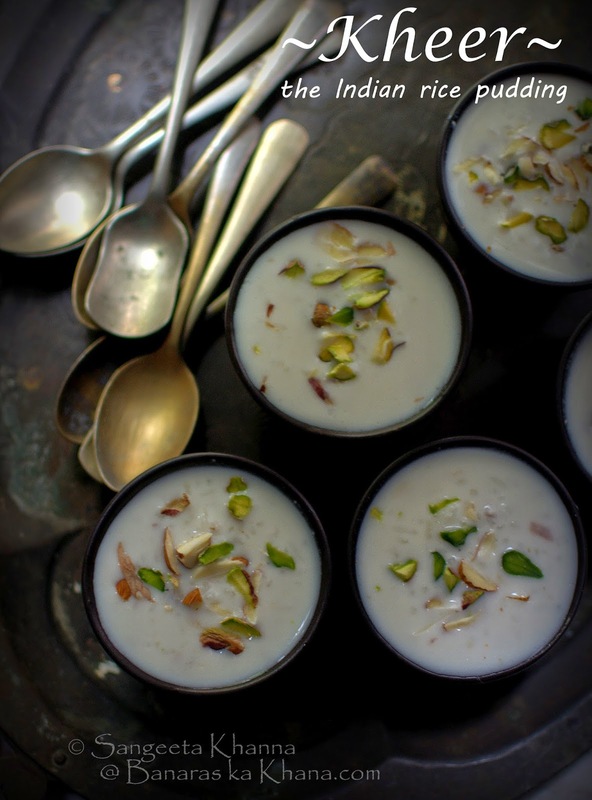 The best kheer recipe differs from person to person. Some people like the rice just cooked while some people (like me) like the rice almost completely dissolved into the milk making it more creamy and smooth. I remember one of my bong friend used to reduce the milk to almost rabdi consistency and then add the rice so the rice just cooked in the remaining water left in the much reduced milk. The resultant kheer used to look like halwa with whole rice grains sticking out and she loved it that way. I could never associate that dessert with kheer though. The rice in my kheer has to be dissolved to creaminess. That makes my kheer perfect. Always with short grain rice. 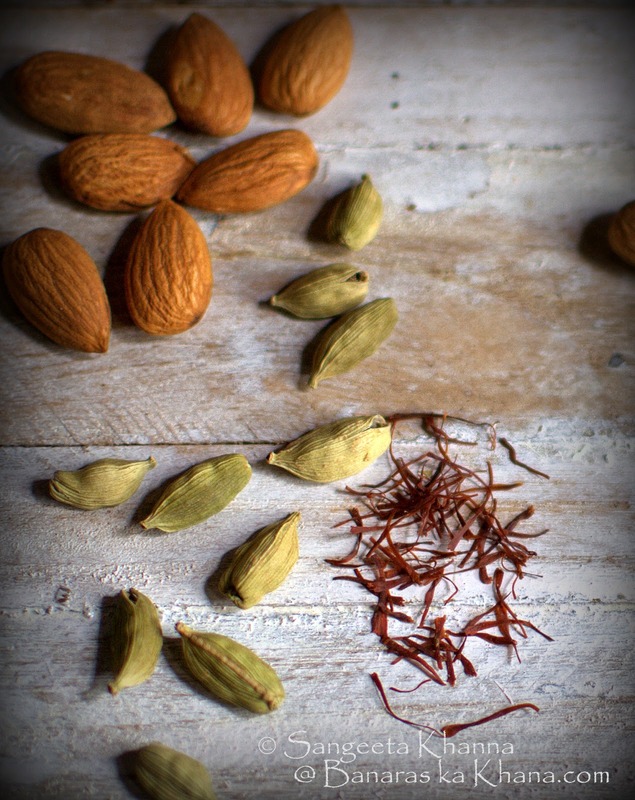 Some people would like more nuts and some aromatic spices like cardamom, nutmeg or cinnamon in the kheer while some like it with rose water or kewda water (screw pine extract). British picked up our kheer and flavoured it with vanilla and what not but even that rice pudding is the best when the rice disintegrates after slow cooking. The baked versions are not just the same. I am listing a few ways to achieve what you want in a kheer. To get your kind of perfect kheer to enjoy. If you like the kheer really thick and the milk caramelized to pinkish brown, reduce the milk with patience for hours. The rice will be added in the very beginning if you like the kheer creamy and the rice grains disintegrated into it and add the rice half way though it if you like your rice grains intact into the kheer. If you like the nuts crunchy or with a bite add them as a garnish. You might like to fry them in ghee for added flavours. But if you like the nuts to soak up and become a part of the creaminess, add them along with the rice and milk together. Same way, if you like the raisins plump and juicy add them while the kheer is reducing, else add chopped raisins as garnish only. Use whole milk for perfect results. Skimmed milk would give you half hearted results. Always add sugar in the last when you see the kheer has reached the consistency you want and the rice has achieved your kind of texture in the kheer. If sugar is added early it doesn't allow the rice to disintegrate, the way I like it. The sugar makes the kheer a little thinner just after adding and the kheer needs to be reduced a little more after adding the sugar. You can add powdered cardamom or nutmeg along with the sugar to allow the flavours to stay in the kheer. The aromas escape if you add these spices in the initial stage of cooking kheer. Avoid adding whole cardamoms in the kheer unless you like to chew on them in between spoonfuls of kheer. Do not add too much rice to the quantity of milk you are using. The bulk or number of servings of the kheer depends on how much milk you are starting with and not the amount of rice. No more than 2 tbsp rice per kilo of whole milk is the rule to follow. Always use good quality aromatic rice. Some people like basmati rice for kheer but I like the small grain gobindbhog or kala namak variety of aromatic rice for my kheer. Keep the sugar minimal so the flavours of the rice take center stage. Don't add too much cardamom or nutmeg to kill the fragrance of rice too. Never make the kheer too sweet. It kills natural sweetness that comes by caramelisation of reducing milk and the fragrance of rice. Add sugar little by little, taste and add more if required. Always cook the kheer on very low heat once the milk had reduced to half. The milk and rice mixture tends to stick to the bottom while cooking and get burnt. This makes the kheer really awful if it happens. Cooking the kheer in thick base vessel helps. Stirring frequently helps too. If you like the kheer warm make sure you serve it with minimal cardamom or nutmeg as these spices can be overpowering at warm temperature. Cold or chilled kheer arrests the fragrance of these spices so you might need to add a bit more of them. 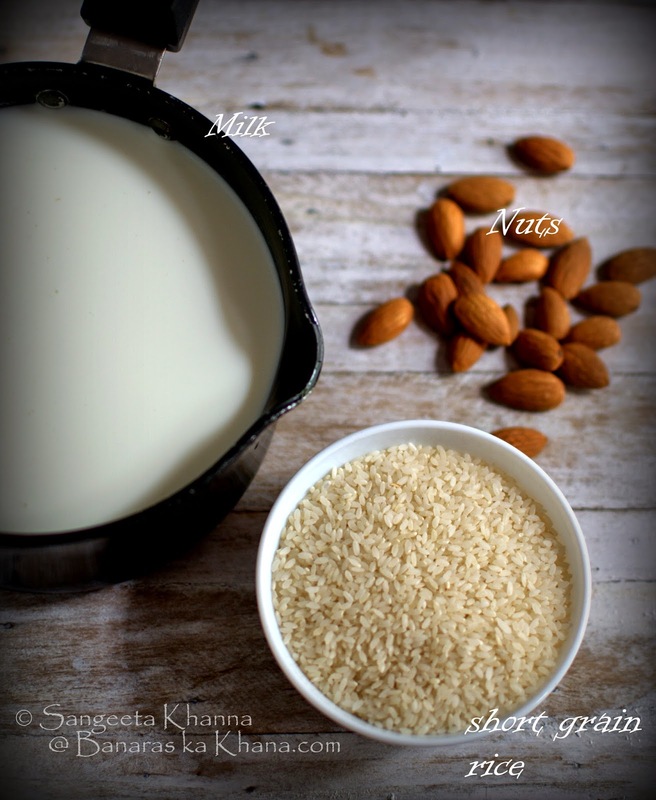 Here is the recipe of my favourite way of making kheer. The everyday kind of kheer that is not too heavy. Mix the rice and milk together and cook on low flame, stirring frequently till the kheer reduces to your preference. The rice should get cooked so much that it almost disintegrates in the reduced milk. Add the sugar and cardamom powder and reduce a little more. You can add more milk at this time if you want and reduce some more to make the kheer a bit rich. You can add saffron or raisins at this point too. Follow the instructions listed above if you have any of those preferences. Garnish with nuts, chill or have the kheer warm as I like it sometimes. You might like this sheer brunj or biranji if you like your kheer really rich. This parippu pradhaman will be a delight if you like this Kerala delicacy. This sevaiyyan kheer used to alternate with chawal ki kheer in out home. And the sama ke chawal ki kheer was made for navratri fasting. There were sooji ki kheer for quick dessert and phirni for a quick but richer dessert sometimes. I intend to share those recipe too sometimes. Let me know if you find these tips on making the perfect chawal ki kheer useful for you. This is all I learned cooking kheer for the family for over 3 decades now.